Politics, corruption and family dysfunction provide a fertile ground for film-makers and while they are not top of the list for us to view, there have been some interesting films made on these topics. There has been a lot of talk about both Leader and Prasthanam taking an innovative approach to these themes but we found each conventional in both their story and structure. Both make reference to land and mineral rights disputes, but the films aren’t really about the issues as much as they are about relationships and power. Because of the parallels and contrasts we decided to discuss them together. For the sake of simplicity, as well as being in keeping with the films’ focus, we are also concentrating on the main story and will skim over the subplots. 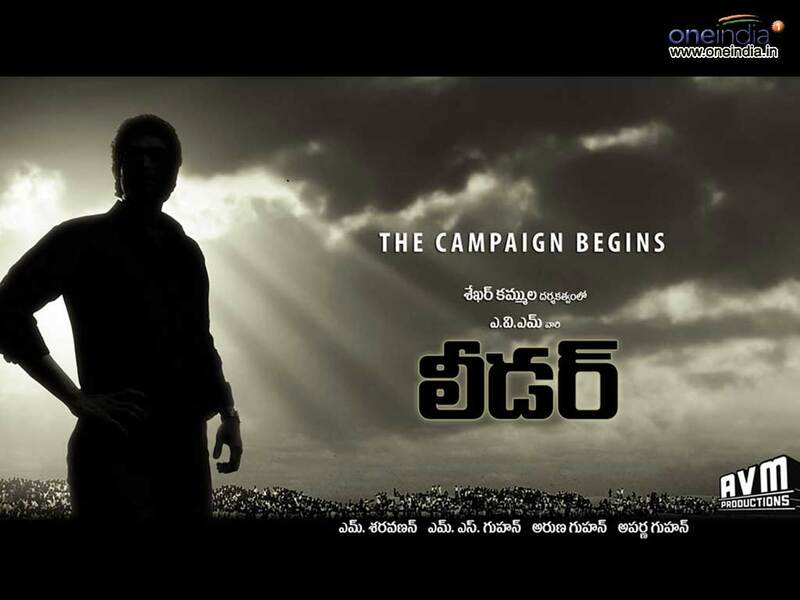 Leader is the debut film for actor Rana Daggubati, and is written and directed by Sekhar Kammula. That’s some seriously good pedigree and the production values reflect this. The story has more in common with Frank Capra’s Mr Smith Goes to Washington than any gritty political thriller but where Jimmy Stewart oozed heart, there is a hard manipulative core to Arjun Prasad (Rana Dagubbati). Arjun has money and is reckoned a man among men (CEO of a Fortune 500 company, Harvard graduate, tall, fine head of hair, looks good with or without a shirt, you know the deal). Despite his aim of rehabilitating the tarnished image of his murdered father through eliminating corruption and caste discrimination, Arjun immediately takes to his father’s methods. He genuinely seems to believe the ends justify his means. Personal relationships are bought and sold and, while he does care for the people he is using, he will sacrifice anyone for his greater goal. Things come to a head after some emotional incidents, and despite some soul searching Arjun fails to change his strategy and continues to use any means at his disposal. After a picturesque montage of Rana’s excellent enigmatic walking, he sets forth to rally the masses and triumph over his rivals. Characters appear along Arjun’s journey, some ready to give him wise advice and some there to set obstacles in his path. But he is a hero in a fable where everything seems to be in shades of grey. The tacit support for bribery and corruption as legitimate techniques is hard to swallow, as well as the disregard for anything that might get in the way of making history take a kindly view of the dead CM. Arjun’s treatment of two women who have feelings for him is cruel, and reminds us that the heart of this story is ice cold. Rana’s performance was difficult to assess. In some scenes he appeared quite deadpan and almost wooden but we believe that was due to the character keeping his cards close to his chest and not wanting to give any clues to his opponents. He is physically imposing and looked the part of the young man on the up and up. Some highly emotional scenes were underplayed and very moving. In scenes that required him to be lighter, more open, and even flirtatious, he was quite appealing so we think it was a combination of his inexperience and the director’s choices that made some episodes appear a bit awkward. There is nothing more to say about the plot – it succumbed to all the clichés and ended exactly as you might expect. But it is an interesting attempt to look expectations of justice and idealism, and transpose that into a political fantasy. The supporting cast were uniformly good, particularly Harsha Vardan as the secretary Ali and Richa Gangopadhyay as the love interest Archana. Priya Anand’s character Rathna was really short changed with some silly dialogues and behaviour but she made a strong impression in her time on screen and certainly injected a lot of energy into her scenes. Prasthanam starts in an independent art house style before the much more conventional end. What begins as a dissection of a bitter dysfunctional family and the play of personal agendas in the public arena devolves into a gore fest with some badly placed songs. Sharwanand plays Mitra, the ‘good’ son of an assassinated father, who seems to be the anointed one in his family’s dynasty. After his father’s murder, Mitra’s mother is married off to Loknatham (Sai Kumar) her husband’s adopted brother. The family relocates to the city but remain involved in politics and factionalism. What really brought the story to life was the dazzling performance by Sundeep Kishan as jealous psycho step-brother Chinna – a substance abuser with a violent streak and a penchant for face paint. His character is a human train wreck: monstrous yet compellingly watchable as he ricochets from self pity to rage to scheming. We differ in our opinion on Sharwanand’s acting but do agree he was one of the weaker elements of the film. The brothers are, on the face of it, totally dissimilar but both are driven by their notion of family and status. As the film progresses, the calculating intelligence and loyalty of Mitra is challenged over and over by the animal aggression of Chinna until the bloody and confronting climax. Mitra discovers that his brother and step-father are far more alike than he suspected and nobody wins as he ultimately takes up the same tactics as his family. Visually the style of Deva Katta’s Prasthanam is both darkly real and annoyingly gimmicky with a reliance on clever angles and effects like blood spattering the camera lens. The songs in the first half are well integrated into the story and maintain a consistent style with the rest of the film. 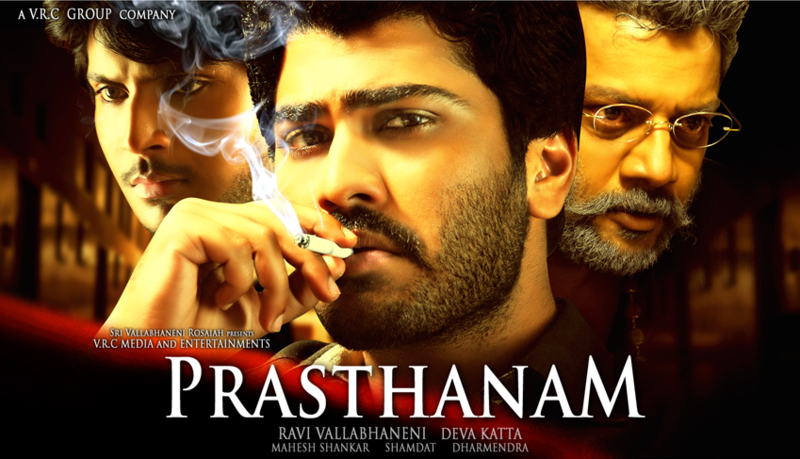 Despite the much messier and grittier environment Prasthanam is as much a fiction as Leader is – but as Dolce and Namak pointed out, this family saga is inspired by Cain and Abel. There is some attempt to inject humour, which is both misplaced and clumsy: one comedic sidekick character declares he will have to go commit a couple of rapes to get more respect, and has this remark met with sarcastic mirth. It was disappointing considering the intelligence behind the writing in general, and wedging the obligatory not so funny comedy track into a film with serious pretensions seemed odd. As with Leader, the female characters provide an excuse for much of the action without having significant roles in the film. Both films rely on coincidence at crucial points, and the strain on our credulity diminished the impact of some key scenes. Both leading men play outsiders. Arjun Prasad is the affluent, privileged, NRI son of a corrupt man, and we see Hyderabad and India through his eyes —mostly from boardrooms, restaurants and resorts. He does a lot of brooding and walking, often seeing without being seen as he floats through the ‘real world’. He says he is going to wake up the apathetic youth, and seems to be a symbol of the young cashed up generation in that respect. Mitra is an unwitting outsider in his own family, but he is intimately involved in the workings of the political games. His world view is far more grounded in a village mentality and his vision of India is much less about air con and fancy cars and more about family and cash flow. This world view shatters when he discovers the truth about his father and step-father. The soundtracks are forgettable, and apart from the really bad picturisations in Prasthanam, the songs had little impact. The lyrics in both films were quite significant in terms of the story but it just seemed to be a bit overstated at times. And as for the naff English lyrics in the final ‘Leader’ song … Neither film really required much in the way of dancing and, while Sharwanand gave it a go, Rana stuck to his enigmatic walking. Ultimately both films fall back into the familiar heroic narrative arc, one tragic and one triumphant. Both are fairly satisfying stories and generally well made films, but neither really departs from the predictable path. Temple says: I found both films quite watchable and engaging, but both have flaws that prevent me from saying I totally enjoyed them. I don’t think they are really attempting anything different in either film as it’s the same old story of corruption and tangled family loyalties, just with modern urban backdrops. Leader is the more successful film for me, as it is has an internal logic and the characters behave in a way that is consistent with their prior behaviour. As my friend Jenni The Mahesh Fan often says, the Dr Phil test for predicting future behaviour is based on past behaviour. So while Arjun Prasad is not a likeable person, the character acts in a way that accords with his previous behaviours. Even when he temporarily leaves politics, he manipulates that hiatus to eliminate an issue that couldn’t be resolved by legal means. So unlike Heather, I never thought he had ‘gone good’. I believed he was just manipulating the situation again which seemed in keeping with his actions to date. The film has a more cohesive story and builds to a cliched yet satisfactory conclusion. 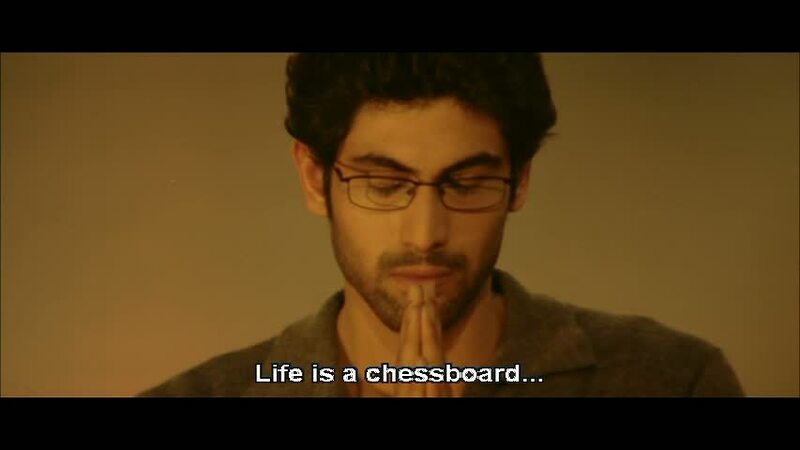 I don’t like the film, as I find its inherent message quite repugnant, but it does work as a piece of drama and once again Sekhar Kammula has told his story in an engaging and slightly offbeat way. Apart from some dodgy green screen effects, the visuals are really effective. I give Leader 4 stars for being a well made, quality film, but I hate the values it seems to promote. 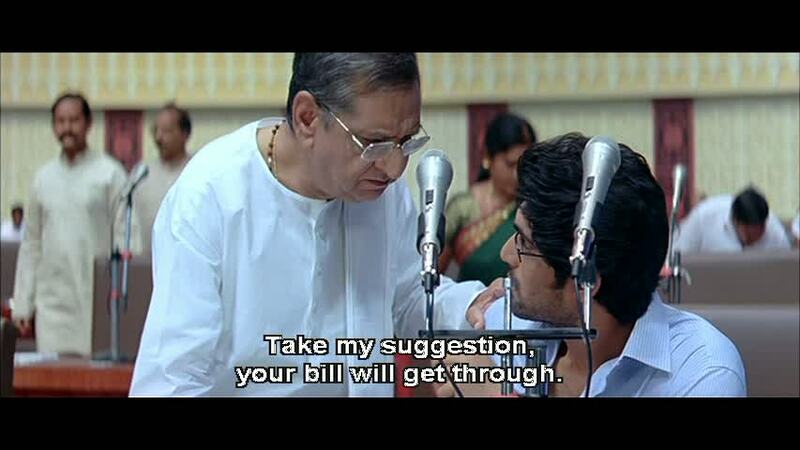 Prasthanam was more entertaining on some levels, and yet a lot less satisfying overall. As the film moved away from the conflict between the brothers and became more about Mitra and Loknatham the wheels started to fall off. 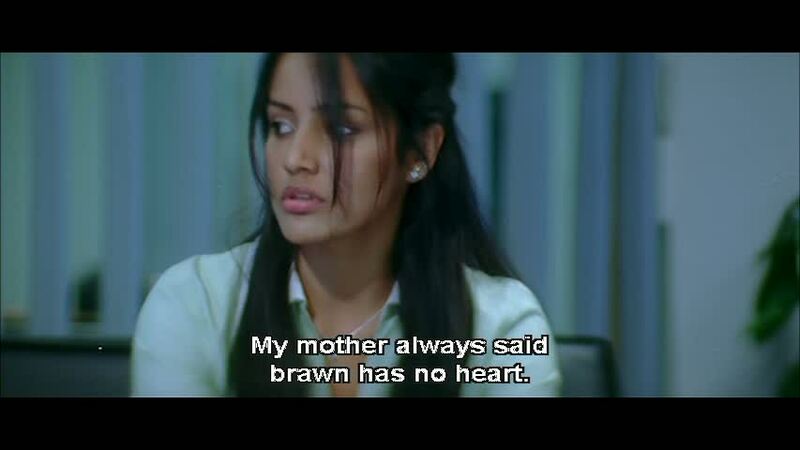 Sharwanand just didn’t make Mitra believable and his performance was weakest of the whole cast. He was fine in the lighter or more conversational scenes, but anything requiring extreme emotion fell flat. It didn’t help that many of the veteran actors around him were chewing the scenery for all they were worth, or that he was acting opposite Sundeep Kishan who just owned the screen whenever Chinna was around. There is something curiously immobile about Sharwanand’s face, and in all the scenes where I wasn’t hooked by his lack of emoting I found myself wondering if he had already started to hit the Botox. The final scenes between Mitra and Loknath were just so tear-sodden and emotional and didn’t ring true for me. I thought the very last moments of Sai Kumar surrounded by a multitude of his mirrored reflection was so much more real and powerful than all the snivelling as it showed what he really believed in. It’s very engaging to a point, but then the climax of the film just doesn’t work for me and the really silly handling of the songs threw the dramatic second half off kilter. I give Prasthanam 3 stars. The women in both films are basically irrelevant to the plot. They are only there as mothers or potential wives and even when it seemed they would play a bigger role, it just didn’t eventuate. The actresses in these roles were all good, but the roles were on the margins of the heroic tales being told. So while it was disappointing to see this happen yet again, it did at least allow for most of the focus to be on the core story. Heather says: I enjoyed both these films, and despite a few irritating features which detract a little from the final overall impression, Leader and Prasthanam are very well worth watching. I think that both are genuine attempts to step outside of the usual Masala fare, and within their limits are interesting stories, told well and with sincerity. Prasthanam for me was a more enjoyable story. 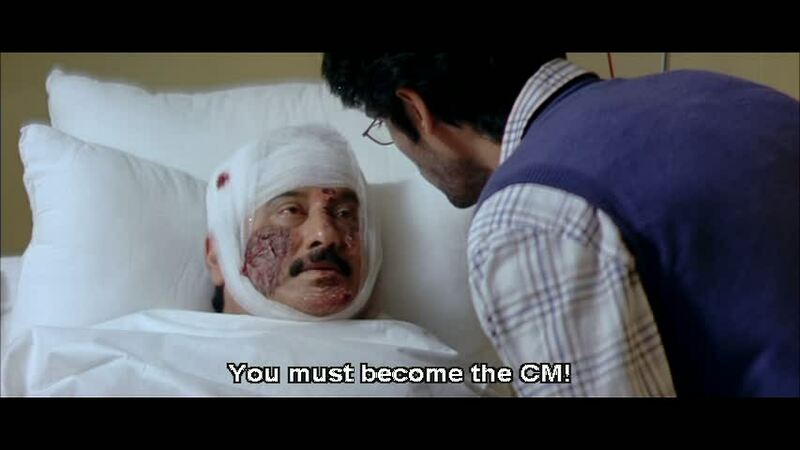 I do like a good villain, and Sundeep excelled in this role. Sharwanand really appears wooden in comparison, and although I am not as critical of his acting as Temple, he doesn’t do his character justice here. The biggest problem I have with Prasthanam is the strange song picturisations and their placement in the second half. They just aren’t necessary and detract from the pace and mood of the film. I liked the soundtrack on first hearing and found it a disappointment to see the songs on screen. The female roles, although still small, seem to be better realised in this film but the struggle between the two brothers and the machinations of Sai Kumar’s character are the definite highlights. The escalation of violence towards the end becomes improbable, and the conclusion is somewhat weak, but despite these flaws the film kept my attention throughout. Again all the supporting cast were very good, and I really liked the cinematography in the opening scenes. Without the songs and the comedy track this could have been an excellent film. As it is, I think it’s still very good and gets 4 stars from me. This entry was posted in Tollywood and tagged Deva Katta, Harsha Vardan, Priya Anand, Rana Daggubati, Richa Gangopadhyay, Sai Kumar, Sandeep Kishan, Sekhar Kammula, Sharwanand, Subbaraju, Sundeep Kishan, Telugu, Tollywood. Bookmark the permalink. Great reading your thoughts as always! You girls seem to have liked Prasthanam much less than I did. But I wonder if the fact that I saw Sharwanand in Gamyam before and found Prasthanam to be a huuuuge step up in terms of acting for him, may have had something to do with this. Because I found him quite watchable in this one. Both when he’s playing the light-hearted romantic hero (which if you ask me is the most unnecessary cliche in this film, from a film making POV, though I quite enjoyed it :P), and when he’s brooding and ruthless. Would I have liked this film without him? You know, now that I think about it, yes, I think I would have still liked it, it has enough going for it to keep me interested beyond the main hero. 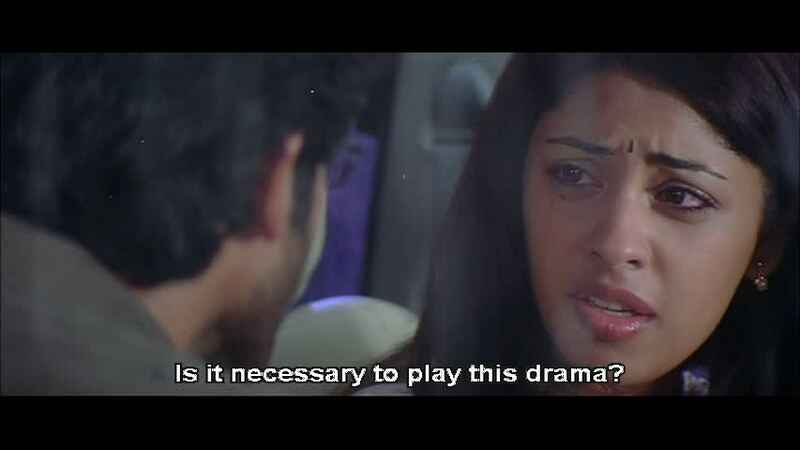 But I’m glad we agree on the Chinna Mitra confrontation being the most interesting aspect of the film. I also thought the pace dropped after their big moment, but was grateful that my heart had time to recover and reach a reasonable level of BPM because that scene had me literally eating my knuckles. Good review thank you. I think you missed the point of Leader which showed what a true leader of society should be. You are not Indian I think so why do you write about just Indian films? Loved the comparison. Like Dolce, I’ve seen Prasthanam, and I’ve had Leader sitting in my pile for a few months now. I liked Sharwanand in Prasthanam and Gamyam, but I have to admit I’m not always as discerning when it comes to judging acting skills vs. charisma. I felt like the mother had a lot of potential to explore as a character, but unfortunately, they didn’t make that choice. I enjoy your reviews. Where do you watch the movies? at the theaters or DVDs? I expected such reviews from you.. 😉 to be honest..
Sai Kumar certainly dominated the scenes he was in, especially opposite Sharwanand. I loved the final scene of him and his multiple reflections – it really summed up his character I thought. Sarwanand comes to know that every thing he believed or looked upto in his “father”(as loyal, dad, leader, husband, human) is a lie. That sounds like good enough reason for me for the final emotional show-down. I agree with Leader though. Its like Forrest Gump, every one seems to love it. Not me.